“Trump has made his loyalties clear,” said Lili Loofbourow in Slate.com, “and they are not to the country he governs.” The president actively took the Kremlin’s side against U.S. interests. Dan Coats, Trump’s own director of national intelligence, has confirmed not only that Russia interfered in the 2016 election, but also that Russian-backed hackers are actively targeting critical facilities in the U.S. nuclear, water, aviation, and manufacturing sectors, and will seek to hack the 2018 elections. But Trump cares only for his “naked self-interest,” and he thinks Putin is on his side. All the more reason for us to see Trump’s tax returns, said Timothy O’Brien in Bloomberg.com. In the decade before Trump became president, he had multiple business dealings with Russians, and went on a $400 million spending spree on golf courses and new properties. “Where did the money come from?” His sons have said the company was getting most of its cash from Russia. “Imagine if Trump were acquiescent to Putin because financial favors were exchanged.” Americans have the right to know. “Get a grip,” said Danielle Pletka in TheAtlantic.com. 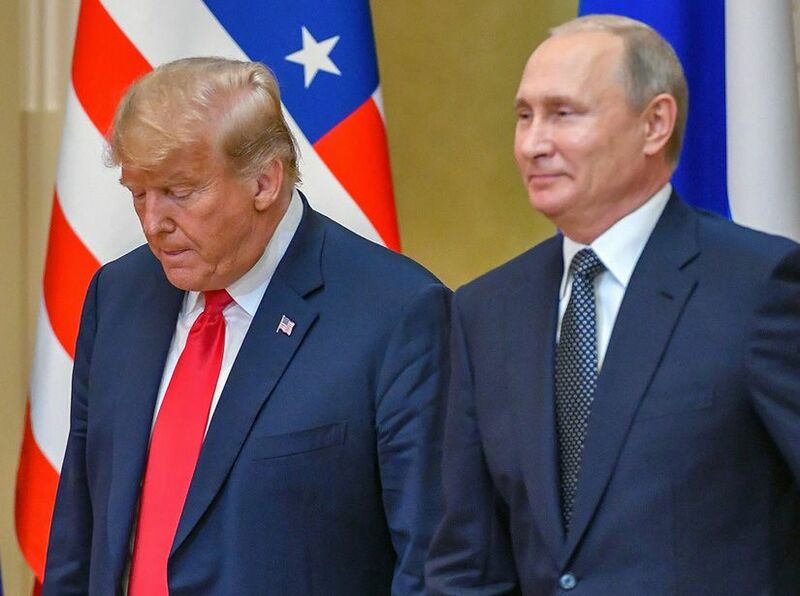 Trump’s performance in Helsinki was “dreadful, even disgraceful—but it wasn’t treason.” Despite Trump’s ill-considered personal admiration for Putin, his administration has been tough on Russia. This White House signed off on increased sanctions for Russia, sold arms to the Ukrainians, and even clashed with Russian troops in Syria. Look at what Trump does, not what he says. Don’t expect Republicans to go too far in rebuking Trump, said Mike Allen in Axios.com. Fearful of the backlash from GOP voters, many of them are already using the president’s tepid walkback of his comments as a “fig leaf” to soften their initial criticisms. “I’m just glad he clarified it,” said Florida Sen. Marco Rubio. “What really matters is what we do moving forward.” Still, Trump’s Helsinki “train wreck” could take the heat off Mueller, said Greg Walters in Vice.com. Until last week, “Trump and his allies appeared to be waging a successful campaign to diminish and undermine the Mueller investigation,” claiming the FBI was biased against Trump and demanding the probe be wrapped up. But fresh questions about Russia’s hold on Trump will make it harder for congressional Republicans to justify pulling the plug on Mueller.